The PK360 cast aluminum grill offers fans of fast, hot grilling and slow barbecue an ideal and versatile tool. Not only does this grill provide an effectively insulated cooking container, but the aluminum material reduces the risk of dealing with corrosion over time. The unit features a pedestal base that's easy to attach to and wide black shelves for prep work and food service. Is the PK360 really all it’s cracked up to be? In this PK grill review we will break down features and specifications to help you understand what this unit is capable of for you to decide if it’s right for you and your backyard grilling and smoking needs. How does the PK 360 cook? Here is a great video review by Alan, an expert backyard smoker and griller, who explains how to use the 360 for the first time and other helpful tips on temperature and the product’s features. Not Interested? See our charcoal grill reviews to help you find the best grill for your needs. Let's start with the most important part of grilling, temperature and venting. The PK grill and smoker offers four places to adjust the vents. The two rotating bars on the bottom will serve to increase airflow and thus rate of burn. As you turn the bars, airflow to the bottom of the grill is increased or reduced. The lid of the grill also has two adjustable holes for venting. The PK360 is ideally suited to long, slow cooking processes that use intense heat and wood smoke to produce amazing flavor and juicy texture. Because the PK charcoal grill offers four vent holes, you can control your rate of charcoal burn. In addition, the heat containment offered by the cast aluminum means that the heat will last longer, require shorter burn times and use less charcoal. While many barbecue fans swear by ceramic cookers, one of the challenges with these tools is cool-down time and risk of cracking the ceramic liner. Additionally, on many of these units the lid mechanism can wear and sometimes fail because the fasteners can't hold the weight of the lid. The only risk with a great temperature gauge is that many cooks will skip the meat thermometer step. The hinges are cast in place, so the loss of connectors like rivets will not impact the stability of your grill lid, and when you're ready to clean it or light it, you can completely remove the lid. 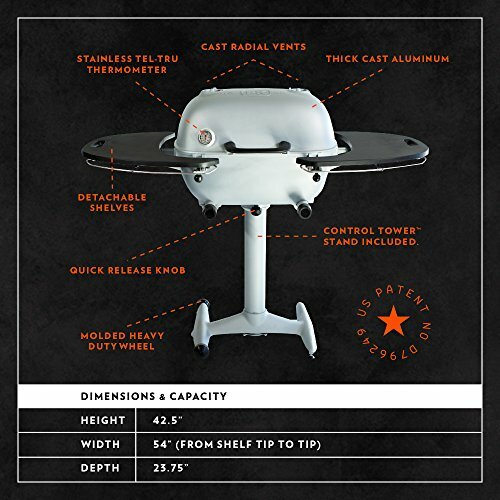 The grilling bowl that holds the food and the charcoal is made of cast aluminum for terrific heat transfer and offers a solid footing for your grates. 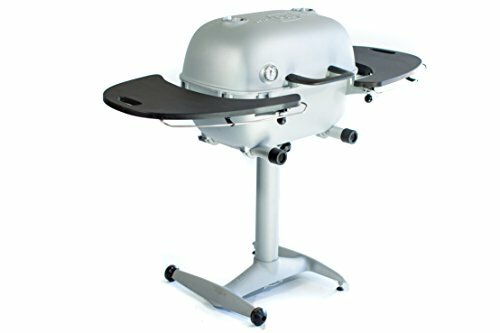 Both the charcoal grate and the food grill are made of marine quality stainless steel for extreme corrosion resistance. If you can keep the grill clean, these materials will naturally resist rust. There are two heat-resistant countertop shelves included with your PK360 that offer an elegant flat black finish. Once your grill has cooled down, grate clean up and ash removals are simple and fairly quick. Clear away the food grate and charcoal grate. Pull the ash plug from the bottom of the pan and sweep your charcoal ash out of the bowl of the grill into your ash can. You'll also see two long tubes or covers over your venting tubes that allow you to control air flow. Finally, the food grate will fit into your dishwasher thanks to the removable hinged portion. 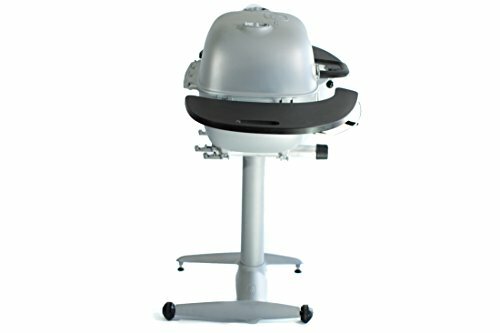 The pedestal base included with the PK360 offers traveling cooks several options. First of all, your PK36﻿﻿﻿0 can be used without the base. Secondly, the pedestal base is easily moved for camping or tail-gating and offers little bulk. The base has heavy duty formed wheels for easy transport and location adjustments. The PK360 weighs in at only 90 pounds for all the components and can be adjusted thanks to the wheels molded into the pedestal. Because the grill is cast, most of the fastenings and connectors are pretty obvious and the knobs and screws are quite large. If you've ever had a steel grill rust out after one season or had the lid hinge crack when you opened your grill, you know how frustrating it can be to watch things crumble no matter how carefully you tend to them. The PK360 is one of those tools that you finally buy when you're tired of replacing things. However, this grill is a sizable investment and definitely not for everyone, especially those with a small budget. How long can I expect the initial load of charcoal to last for a long slow cook? Also, I prefer lump charcoal over charcoal briquettes, can this grill use both?